Grate the cucumbers using the grating disc in a food processor. 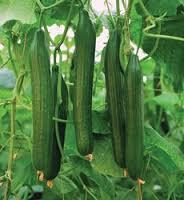 Switch to the steel blade and pulse until cucumber is finely chopped. Repeat with onions and peppers. 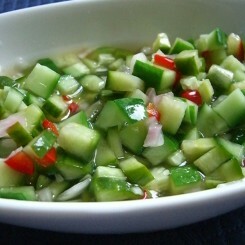 Place chopped cucumbers, onions, and peppers in a medium bowl and mix in salt. Cover and stand overnight. Pour vegetable mixture into fine mesh strainer. Rinse under cold water and strain, pushing the vegetables against the side of the strainer using a rubber spatula to remove as much water as possible. In a medium saucepan, bring vinegar, sugar, mustard seed and celery seed to a boil over medium high heat, stirring to dissolve the sugar. Add vegetable mixture, reduce heat to medium-low, and simmer for 10 minutes, stirring occasionally. Leave to cool to room temperature. Transfer relish to an airtight container and store in the refrigerator .